Capt. 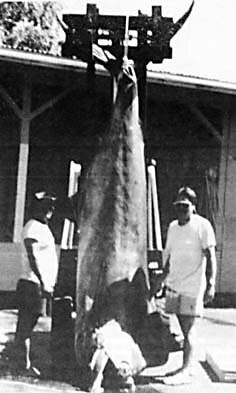 Wayne Rabang of the 19-foot Alii Kai skiff, the THREADFIN, was trolling outside of Kea'au Bay when he hooked Ivan Mochida to this 1212-lb behemoth. The 100-lb test Maxima line on their 80-class Shimano Tiagra two-speed reel was put to the test over the next five hours.